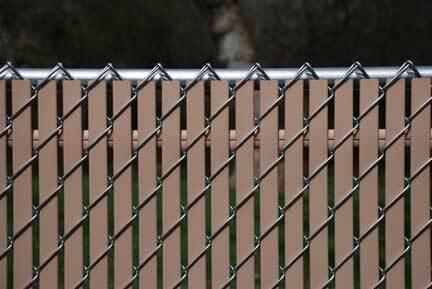 Fence slats are flat tubular plastic extrusions which are inserted into any type of chain link fencing to add beauty and privacy to both sides of fence. Once installed, Fence slats are virtually maintenance free. Salt, sand and road dirt will not harm the slats in any way. 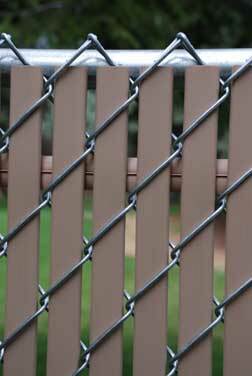 Due to the UV inhibited thermo plastic design, Fence slats will not fade, chip or discolor for at least 15 years. Top locking slats have a special locking feature, Once the horizontal strip is in place, the slats cannot be removed easily from the fence. Material − Manufactured from High Density Polyethylene (HDPE) and UV stabilized to protect the slats from the sun’s ultra violet rays. Colors − Available in 9 standard colors (see color guide below). Custom color matching available. Strength − All OptionLock™ slats are reinforced with a center leg. 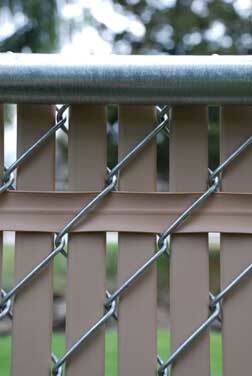 This provides for a strong, durable slat that allows easy installation and helps hold its shape for years to come. Quantity Per Package − You’ll get enough slats to cover ten lineal feet of fence per bag; Guaranteed! Acceptance − All materials used in OptionLock™ slats meet ASTM Specifications. NOW AVAILABLE IN ROYAL BLUE!